Kayla Bragg shown with fellow troops in Afghanistan. Mikayla Bragg's stepmother Amber Bragg and her stepbrother Joe Bragg answer questions as they serach for pictures of Kayla on a Facebook page. A female Mark Morris High School graduate was shot and killed Wednesday in a guard tower in Afghanistan, according to the soldier's stepmother. U.S. Army Specialist Mikayla Anne Bragg is Cowlitz County's first casualty in a combat zone since the Vietnam War, according to Daily News archives. Bragg, 21, was scheduled to leave Afghanistan around Christmas and return to the United States on Jan. 6, stepmother Amber Bragg of Longview said Thursday. Army officials have not yet confirmed the death or released any information about the incident. Bragg's father, Steve Bragg, flew to the U.S. Air Force base in Dover, Del., to identify her remains, her stepmother said, adding that the Army is planning to conduct an autopsy. 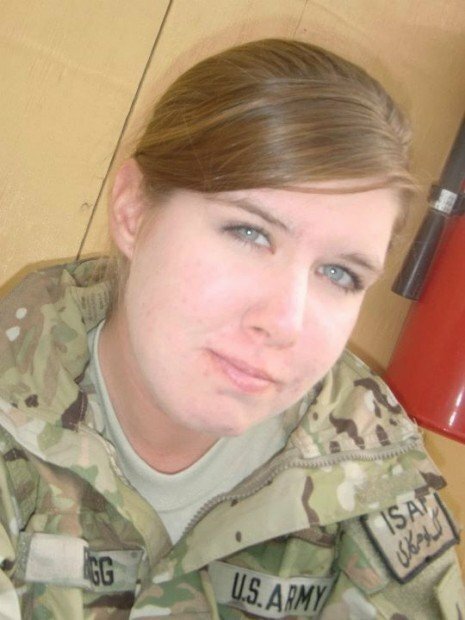 Bragg enlisted right after she graduated high school in 2008, Amber Bragg said. Family members said Bragg was deployed from Fort Knox in Kentucky to Afghanistan in August. She graduated basic training at Fort Sill in Lawton, Okla., and she was classified as a sharpshooter because of her accuracy with a rifle. According to her Facebook page, Bragg's primary duties were as a motor transport operator for the Third Brigade Combat Team, First Infantry Division. Bragg will be buried in Longview but the family has not set a date for the funeral. About 1,700 U.S. military personnel have been killed in the war in Afghanistan since it started in 2001. Survivors include mother Sheyanne Baker of Shelton, Wash., sister Kandyce Bragg of Shelton, half-brother Allen Davids, currently serving in Iraq with the U.S. Army, and half-siblings Joseph Bragg and Ariel, Darien and Julian DeForge. Mikayla Bragg joined the Army to earn money to pay for college and she hoped to go into a field helping people or animals, Amber Bragg said, adding "She's always been a kind-hearted person. She's always gone out of her way to help out other people in whatever way she could." Best friend Tiffany Holst, 21, remembers Bragg, who loved "goofy kid movies" like "Finding Nemo" and "The Spongebob SquarePants Movie," would always cry when Bambi's mother died when watching the Disney film. "She was always like that," Holst said. "She loved animals." The Bragg family recently moved to a different home in Longview, which Amber Bragg said resulted in a slight delay in the family being notified by the Army. Once family members were informed in their front yard, Amber Bragg recalled a man working for a tree service across the street noticed something was wrong and offered to help without giving his name. It was a bright moment in an otherwise tragic day, she said. "He brought us dinner for our family and brought us a gift card to help out with whatever we needed. You don't see that anymore," she said. In the living room of the Braggs' Highlands neighborhood home, framed photos of the children cover the walls. Next to the kitchen doorway, "Kayla" — as her friends and family called her — is at a high school formal dance in a red gown, posing with her date in a tuxedo and top hat. Family and friends said she had a unique presence, once sporting a mohawk haircut and sometimes wearing skirts with jeans underneath. "She definitely had her own style," said Denae Smith, who once worked with Bragg at the Walgreen's drug store along Ocean Beach Highway. "She was the one with the crazy hair and crazy makeup. I wouldn't call her gothed out, but she was definitely wild." Beneath Bragg's dark-clad exterior and distinctive makeup choices, Smith said her kindness always came through. A certain cranky customer once entered the store looking for batteries and brought Smith to tears after a few days on the job. Smith said it was Bragg who tried to joke around and cheer her up after helping the customer. "She made everybody laugh," her friend Holst said. "She was sweet and caring." She also was a young woman with typical desires and doubts. 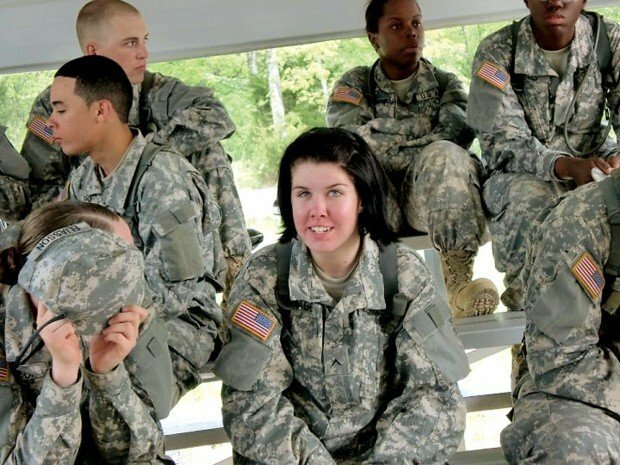 Bragg was excited to join the military for the adventure and better pay, but was afraid to leave her family behind and dreaded the thought of being deployed. "But she was strong. ... And she liked the bases," Holst said. "She liked looking at all the guys. She didn't like wearing her uniform because it made her look like a guy." Holst exchanged messages with Bragg via Facebook seven hours before she died, and the two talked about men in their lives and how they looked forward to seeing each other when Bragg returned. Tiffany's mother, Linda Wheeler, reminisced how much Bragg changed as she transformed from a meek 12-year-old girl she first met into an outgoing woman. "You would've had to have met her to know Mikayla," said Wheeler. "We watched her grow up into a mature, wonderful woman. She was a heck of a character, she would always help people smile. And she'd always let you know if you were doing something you weren't supposed to be doing. ... She died a hero in my eyes." • "RIP Kayla Bragg Thank you for serving our country and I can't believe at the end of the war, war took your life. I am so sorry for her friends and family my heart goes out to them!!" • "It's so hard to accept that you're not here physically but you will always be in my heart. I'm so glad that I got the chance to meet such an amazing person like you. I don't think you know how many smiles you put on peoples faces; especially mine. I love and miss you. R.I.P. Kayla Bragg." • "You were definitively one of those people who always just said whatever u wanted to whoever and damn the consequences, Always had respect for you, and I'm definitively going to miss you..RIP"
• "my worst nightmare came true today. and i have no idea how to handle it. you were always the person i went to when i felt i couldnt continue on. and now you are gone. i love you so much." The Pentagon confirmed Friday the death of the Longview soldier who was serving in Afghanistan. Details are still scarce surrounding the death of the Longview soldier who died in Afghanistan last week. 'Fell through the cracks': Could Longview soldier's death have been avoided? Fellow soldiers said farewells to Army Spc. Mikayla Bragg at Fort Knox Thursday in an emotional service that helped blunt her family's pain.